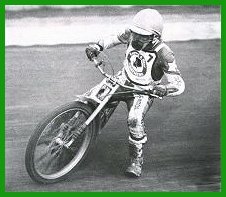 John first rode for Cradley in August 1977 and made his league debut in September with five points against Leicester. He was signed by Dan McCormick to ride at Oxford and gradually made the transition between leagues via the Cradley junior scene. He was bought to Oxford from Glasgow and during 1978 he forced his way into a heatleader role with the Cheetahs. 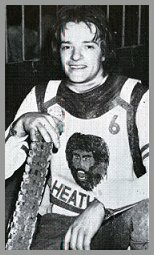 The Mancunian had ridden a handful of matches for Cradley in the '77 season and again in '78 before being given a more extended run in 1979, whilst still riding for 'sister track' Oxford. After 13 appearances in that third season including the victorious Knock Out Cup Final against Hull, he was handed a permanent place in the side for the start of the 1980 season, leaving the National League for a full-time British League reserve spot. He settled quickly and showed the potential that McCormick had spotted some years earlier, while also working for Peter Collins in his Manchester motorcycle shop. By the Summer he was notching notable scores including a ten point haul against Sheffield in the Inter-League Cup and eight against Coventry - his best British League return. Approaching the end of what would be termed a reasonably successful season in the top flight, Hack suffered serious head injuries in a nasty crash at Monmore Green. Arthur Browning, riding as a guest for Wolves, lost control on a greasy track and his bike hit John, sending him uncontrollably into the lamp standard. He suffered a fractured skull, broken ribs and a broken leg, staying on a life support machine for eight days. That British League match on 12th October was his last Speedway meeting as the accident proved to be more than enough to prematurely end his promising career.